The constant pressure placed on government to provide more and better services for its citizenry brings with it the burden of added costs to taxpayers. Taxes have a way of permeating into virtually every facet of business today. 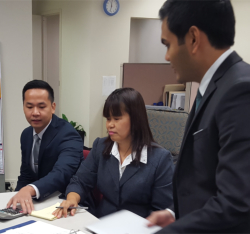 Valles Vendiola LLP tax advisers are focused on minimization of our client’s taxes. We alert our clients of the tax consequences of their actions and decisions; we keep them informed of the latest changes in tax laws, which might have an impact on their business and we develop strategies to bring the greatest advantage to their businesses.